Let’s be honest, none of us can be right ALL of the time, none of us are perfect after all. It’s natural to make mistakes in one’s job, right!? That’s understandable. However, when you’re being PAID to ACTUALLY get it RIGHT, like, when that’s your ONE JOB, to just get it right, you’d think that people would at least make more of an effort? You would think so…but no…ENTER THE TRANSLATOR! 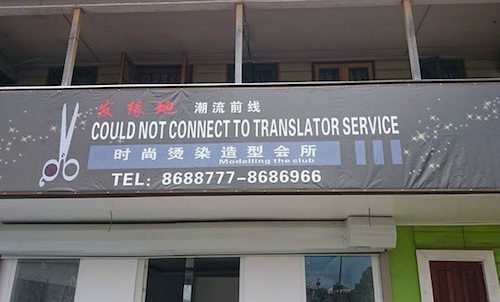 Well, for the following 15 translators, that certainly is NOT the case! I wonder if they got fired after these epic fails? What did those vegetables do to this translator that was so bad!? 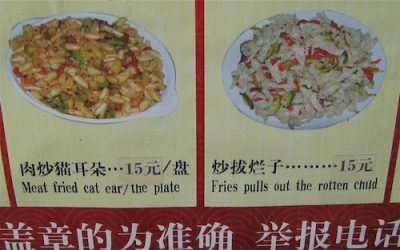 I mean, I know they’re not always the most appetizing option, but it seems a little much. Maybe they were on a diet and got distracted? It happens, believe me, I know! 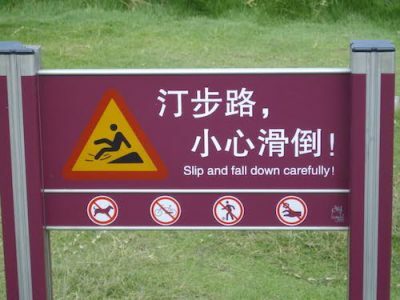 If you’re going to slip and fall, then at least do it carefully and considerately. Don’t break too many bones, if you can help it! 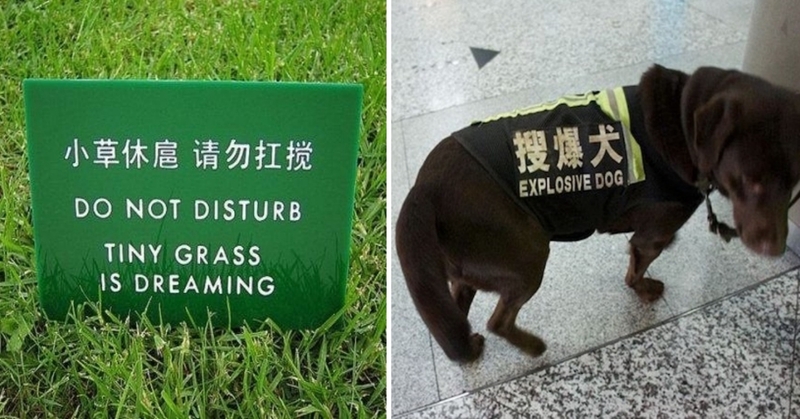 Thanks to this translator, what is obviously a warning, turned into a suggestion. 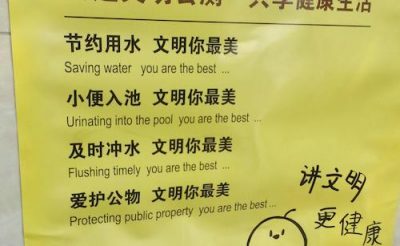 Overall, a hilarious mistake, however, I’d love to know what the actual translation for this should have originally been. Also, Hollywood if you’re reading, hit me up anytime over the foot idea!?? Call me! This makes me feel a little sick, to be honest. 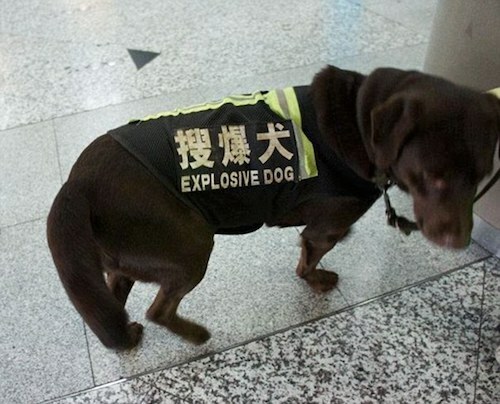 I’d heard the whole horrifying rumours about the whole Chinese eating cats and dogs thing, so I really hope this isn’t some kind of Freudian slip by this distracted translator. 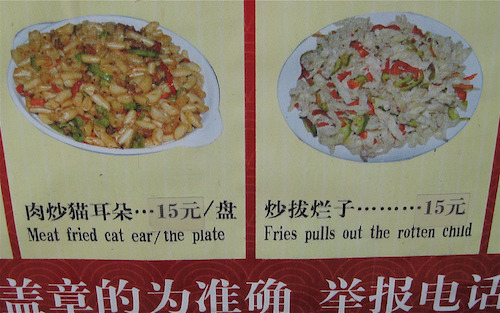 & If so, I’d really worried about the rotten child bit, but to be honest, I’m more worried about the Cat! 5. Wait, what was that one again? Urinating into the pool makes me the best person? That’s great and all, and I’m all for saving water, but I think I’ll skip that one. I just hope that too many people didn’t take that literally…or it won’t be just the sign that’s yellow, urgh! 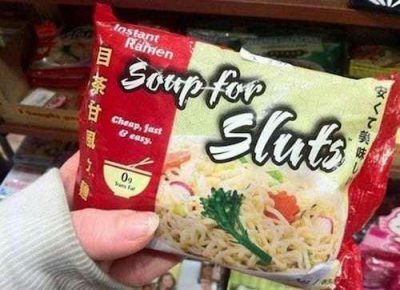 Wow, I didn’t know there was an actual demand for sluts to get their own soup! Well, thanks to one air-brained translator, the dream has now become a reality! 7. Do you have anything else, perhaps? I don’t even want to know what this should have originally been. The mind boggles! 8. 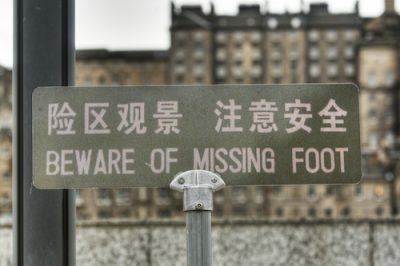 Surely we need more warning than that!? Is that all that’s needed to warn people of an impending execution these days? A yellow warning cone? 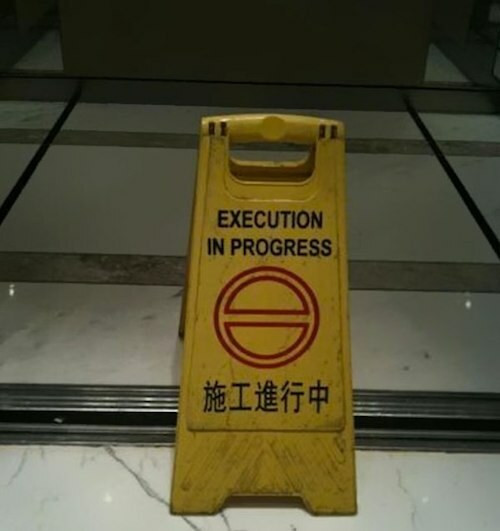 I’m guessing they meant some kind of ‘clean up’ warning, and hopefully, NOT in the mafia sense of the word. I don’t think this should be classed as a mistake, at all! 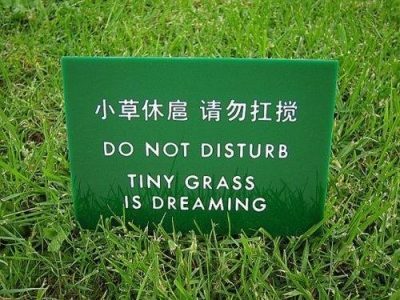 I won’t disturb you, tiny grass, don’t worry! You keep on dreaming, reach for the stars! Doggo can’t blow up! I won’t allow it! I’m sorry, but did you mean: my ex? 12. Surely, this is a poor move!? 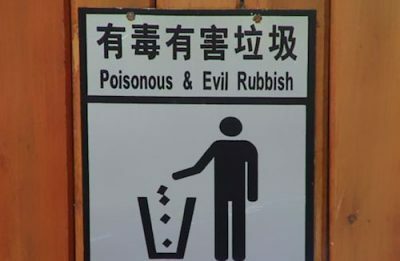 I know this is a mistake, but surely the translator would at least notice that this is a contradiction in itself? It wouldn’t be a true suspicious supermarket, if it was warning every one of its suspiciousness, would it? 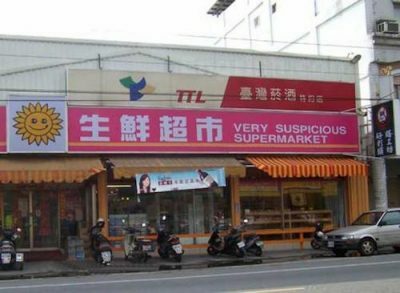 Or is that why it’s suspicious!? 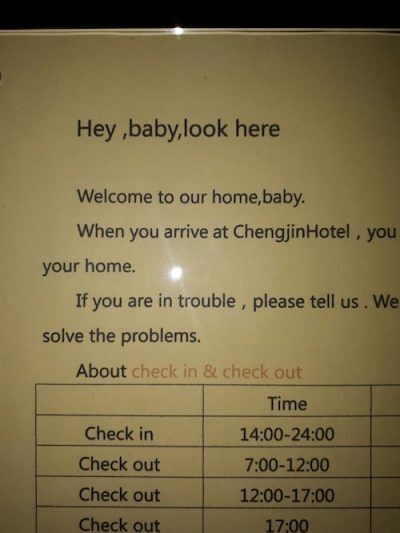 Hotels abroad are getting terribly over-familiar these days, aren’t they!? & Who said you could call me baby, anyway!? 14. The fresher the better! 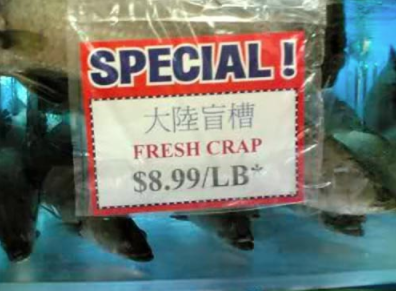 I didn’t know that there was any call for ‘fresh crap!’ I think you may be mistaken for my ex again, to be honest! This is hilarious! How has someone ACTUALLY MISSED THIS!? It’s not even been connected to the translator. I need to know how many people and pairs of eyes, that this got passed without them even noticing the mistake!? 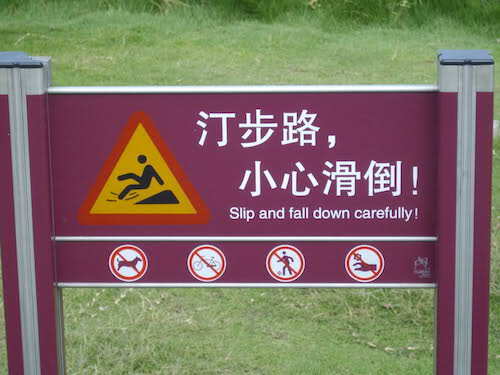 Obviously, a day off for the translator’s that day…and for everyone else’s brain and common sense by the looks of it, too! Which one of these hilarious fails was your favorite? 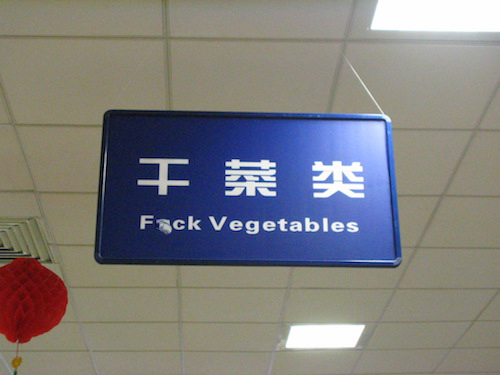 Have you ever spotted an epic translator fail!? Let us know!